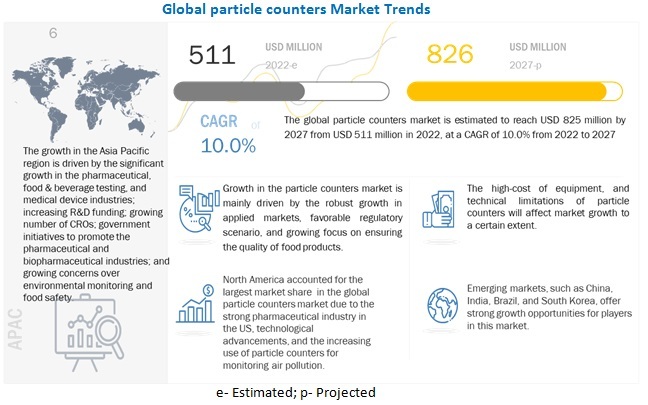 [152 Pages Report] The particle counters market is projected to reach USD 330.6 Million by 2021 from USD 275.9 Million in 2016, at a CAGR of 3.7%. The growth of the market can be attributed to the growing pharmaceutical and semiconductor industries, increasing spending on pharmaceutical R&D, and growing manufacturing industries in emerging nations. In the coming years, the market is expected to witness the highest growth in the Asia-Pacific region. This can be attributed to factors such as the growing pharmaceutical and semiconductor industries and increasing manufacturing activities in the region. North America accounted for the largest share of the global market. Growth in the North American market is primarily driven by the growing pharmaceutical industry, rising hi-tech industries, and increasing employment of particle counters for air pollution monitoring. This report segments the particle counters market based on type, application, end user, and region. On the basis of type, the market is segmented into airborne and liquid particle counters. The airborne particle counters segment is expected to command the largest share of the global market. This can be attributed to factors such as increasing pharmaceutical industry, increasing manufacturing industry and rising awareness of cleanroom monitoring. The airborne particle counters segment is further divided into portable, remote, handheld, and condensation particle counters. The liquid particle counters segment is further categorized into online and offline particle counters. On the basis of application, the particle counters market is segmented into cleanroom monitoring, air quality monitoring, contamination monitoring of liquids, drinking water application, aerosol monitoring and research, chemical contamination monitoring, and other applications. The cleanroom monitoring segment is expected to account for the largest share of the market in 2016. This segment is projected to register the highest CAGR from 2016 to 2021. This can be attributed to the growing pharmaceutical and semiconductor industry. On the basis of end user, the global market is segmented into the healthcare industry, semiconductor industry, automotive industry, aerospace industry, food and beverage industry, and other end users. In 2016, the pharmaceutical industry is expected to account for the largest share of the global market. Rising geriatric population, increasing prevalence of chronic diseases, increasing consumption of drugs, and increasing spending in pharmaceutical R&D is expected to augment the demand for particle counters in this end-user segment. The particle counters market is projected to reach USD 330.6 Million by 2021 from USD 275.9 Million in 2016, at a CAGR of 3.7%. Growing pharmaceutical and semiconductor industries, increasing spending on pharmaceutical R&D, and growth in manufacturing industries in emerging nations are key factors driving the market growth for particle counters. The global market is segmented on the basis of type, application, end user, and region. On the basis of type, the global market is segmented into airborne and liquid particle counters. The airborne particle counters segment is further categorized into portable, remote, handheld, and condensation particle counters. In 2016, the portable particle counters segment is expected to account for the largest share of the airborne market. The large share of this segment can be attributed to the high sensitivity and flowrate of these devices. The online liquid particle counters segment is estimated to command the largest share and register the highest CAGR in the global liquid particle counters market in 2016. The largest share of this segment can be attributed to the advantages provided by these devices, such as online sampling and continuous condition monitoring. Furthermore, growth in pharmaceutical and semiconductor industries which require continuous monitoring of fluids is expected to provide impetus to this segment. On the basis of application, the market is segmented into cleanroom monitoring, air quality monitoring, contamination monitoring of liquids, drinking water application, aerosol monitoring and research, chemical contamination monitoring, and other applications. In 2016, the cleanroom monitoring segment is expected to account for the largest share of the market; whereas, the contamination monitoring of liquids segment is expected to grow at the highest CAGR. On the basis of end user, the particle counters market is segmented into healthcare industry, semiconductor industry, automotive industry, aerospace industry, food and beverage industry, and other end users. In 2016, the healthcare industry commanded the largest share of the market. This large share of this segment can be attributed to the rising pharmaceutical industry and increasing R&D expenditure. The market for the semiconductor industry is expected to grow at the highest CAGR in the market during the forecast period. Technological advances of semiconductors and rapidly growing Asian market are driving the growth of this industry. The particle counters market is segmented into four major regions, namely, North America, Europe, Asia-Pacific, and RoW. Among these regional segments, North America is expected to account for the largest share of the global market in 2016. However, the Asia-Pacific region is expected to grow at the highest CAGR during the forecast period. The high growth in this regional segment can be attributed to factors such as the growing pharmaceutical and semiconductor industries and increasing manufacturing activities. Particle Measuring Systems (U.S.), Beckman Coulter (U.K.), RION Co., Ltd (Japan), Lighthouse Worldwide Solutions (U.S.), TSI (U.S.), and Climet Instruments Company (U.S.) are some of the key players in the particle counters market. 9.2.1.1 Strong Pharmaceutical Industry in the U.S.
11.10 Met One Instruments, Inc.